Whether your adding a new set of steps or walkway, or just looking to replace an old one, you've come to the right place. 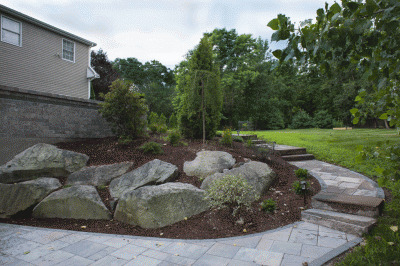 Elvio and Sons can install natural stone, paver, or cement walkways and steps in your yard. Our work carries a lifetime guarantee and will surely add to the value of your home. With options nearly limitless, we are happy to take the time to help you find the right look and feel for your home. We recommend and install Unilock pavers, the industry's accepted elite paver. 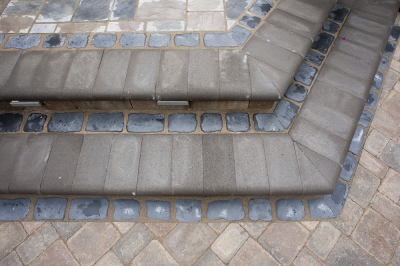 Your new walkway and steps are guaranteed not to settle or bulge with ice heaves during the harsh New England winters. We commonly replace the front steps and walkways to homes. With many projects taking less than one week, this is a quick way to beautify the front of your home and increase your curb appeal. Financing options available for your walkways and steps! With the help of LightStream Financing, a division of Sun Trust Bank, we are happy to provide complete financing options for your new walkways, steps, in-ground gunite pool, patio, and backyard living space. Approval comes in as little as a few hours! Interest rates are low and you can apply online.